You don't have to have a mental disorder to be a great author, but those lightning leaps of imagination and hours spent constructing fascinating stories, multi-layered in meaning and unique in style, can sometimes be linked to mental illness. Many of the 20th century's great writers, including Virginia Woolf, Ernest Hemingway, F. Scott Fitzgerald and his wife Zelda Fitzgerald, and William Styron, suffered from mental illness. During May, which is Mental Health Month, take a moment to examine the difficult lives of these writers. 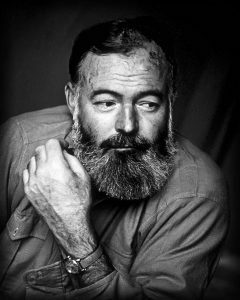 Ernest Hemingway, author of such classics as For Whom the Bell Tolls and The Old Man and the Sea, had perhaps inherited a predisposition to mental illness, but it was a bloody plane crash while he was in Africa in the 1950s that set in motion the events that lead to his suicide. As a result of his severe injuries, he was put on high blood pressure medication. In the 1950s, the side-effects could include mental aberrations. In "Papa" Hemingway's case, the effects were so disruptive that he was hospitalized. The electro-shock treatment they used on him there in no way resembled the relatively gentle voltage in use now. He would return to his beautiful home in Cuba, crying to his fourth wife to not send him back for more shock therapy. His memory was shattered, his health still poor from the accident years ago, and decades of hard drinking had taken their toll. It was on one of these visits home that he shot himself. Virginia Woolf's tragic life was part of the award-winning film, The Hours, starring Nicole Kidman. There was so much death in Virginia's early life - her father, her mother, and her half-sister. It was her brother's death that led to her first mental breakdown. At the last, the founder of the Bloomsbury group of writers and author of such feminist masterpieces as To the Lighthouse and A Room of One's Own filled her pockets with stones and walked into river near her home in Sussex. Both F. Scott Fitzgerald and his wife, Zelda, lived a life of glittering parties at fashionable resorts throughout America and Europe. Tellingly, he once said, "Sometimes I don't know whether or not Zelda and I are real or whether we are characters in one of my novels." Zelda, herself an author, became increasingly broken by mental illness and ended her days in an institution. Fitzgerald gives vent to some of his feelings on her breakdown in the novel, Tender is the Night. Later, his autobiographical book of essays and letters, The Crack-Up, showed his own fight with depression. More recently, William Styron, author of the Pulitzer Prize-winning book, The Confessions of Nat Turner, and Sophie's Choice, shared his struggle and victory over mental illness in the book, Darkness Visible: A Memoir of Madness. Darkness Visible is a short book but a brave one, written with lucidity even in the face of monstrous suffering. Today, it is cheering to know that as medicine progresses and mental illness becomes less a thing to be hidden than an accepted problem to be treated appropriately, fewer and fewer patients need be driven to the extremes of these writers. With greater public understanding and strides in health care, the prognosis for mentally ill people has improved dramatically. If you are concerned about your own or a loved's one mental health, contact your family doctor. The National Alliance for the Mentally Ill can provide background information online. Libraries also stock materials on depression for patients and their families.